The Scholarship Oversight Committee (SOC) is a group of mentors dedicated to supporting the fellow’s research project throughout the fellowship years at the University of Virginia. The SOC members meet with each fellow biannually in a formal setting to review the fellow’s research project. 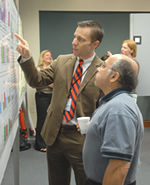 Biannual reports and education plans are reviewed by the Pediatric Research Advisory Committee. Ultimately, the fellow compiles this information and submits to the American Board of Pediatrics in order to qualify to take the Board exam in their subspecialty. Formal documentation of each fellow’s research planning and progress is required. Please consult the time table below for the due dates of your documentation. Documentation must be current if you wish to receive the Travel Stipend allotted by the Department of Pediatrics. Questions? Contact Fellowships Administrator, Holly Sanders, at hs3fm@virginia.edu or 924-9148. You must organize a meeting with your Committee. Have all members sign the form at this meeting. Include meeting minutes, agendas, presentations you may have used. The third year of fellowship can be guaranteed only if you apply for extramural salary support by no later than fall of the second year. Planning for this grant application will need to begin in spring of your first year. Project Plan should include any communications and other documentation that contains feedback, suggestions, etc. This plan must be signed by your committee. Have all members sign the Interim Report form at the meeting. Include any meeting minutes or agendas you may have used. If you have adjusted your Education Plan, submit a revision with the Interim Plan. If you have adjusted your Education Plan, submit it with the Interim Plan. Submit Board packet for final evaluation (which includes the verification of competence form). Submit Fellow Final Report (have a final meeting with all of your committee and have all members sign form at this time, turn in with minutes of meeting). – A description of the scholarly activity. – A description of the fellow’s role in each aspect of the activity. – An explanation of how the scholarly activity relates to the fellow’s career development plan. – A copy of the Work Product by the fellow.